Welcome the Year of the Rabbit! Hawaii’s population is approximately one third Chinese according to one of the writers for Examiner.com although that number includes those who are of mixed race like my children. Therefore, like many homes in the islands we celebrate Chinese New Year. Three years ago I even learned to make gau, a sticky brown sugar sweet treat made with rice flour to bring sweetness to the new year and help the family to stick together. My mother-in-law makes the jai , a Chinese vegetarian dish for celebration of the new lunar year. I am grateful for my multicultural family and that we live in Hawaii where children grow up respecting multiple cultures. The Lion belongs to my son. 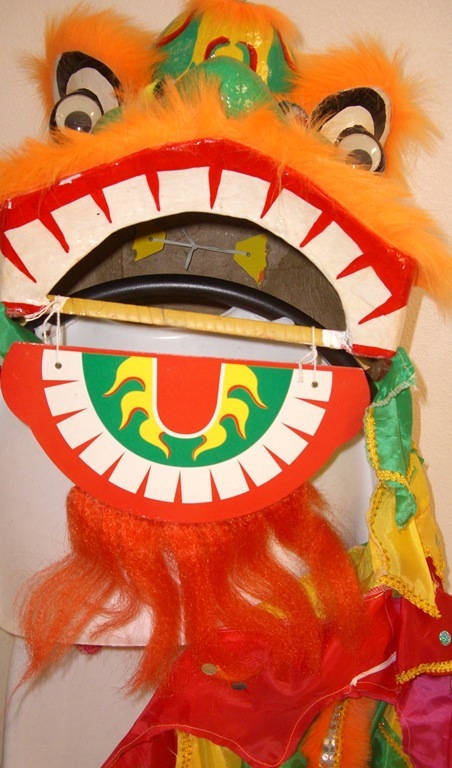 My children used to pretend to perform a lion dance and ask for money from us when they were younger. Traditionally feeding the lion money is supposed to bring one luck and wealth. Now our lion is mostly for decoration although my two still like getting money. Lia see is the custom of giving lucky money in special red envelops to unwed children as a symbol of good luck and wealth. For more about symbolism and Chinese New Year celebrations you may read: Symbolism holds sway for Chinese New Year – Hawaii Features – Staradvertiser.com. And/or Life is Good| Changing Times blog, staradvertiser.com | Honolulu, Hawaii. May you and yours have a year of harmony, joy, health, and prosperity! I love reading about other celebrations and I feel it is so important to raise your children so they are exposed to each families root of celebration and customs. The colors and festivities make this such a wonderful celebration. I’m a sheep (ram) and a goat in the zodiac so it seems to be an animal that is always with me. Yes, I agree knowing both sides of the family history is important. You’re a sheep, that explains a lot. “…I strive to find beauty in all I behold. Thank you for this. Your family’s multicultural heritage is definitely something to be cherished. I have Chinese family members. They just celebrated Chinese New Year the other day. I love the Chinese customs and holidays. I especially love the importance of honoring family ancestors. My children have gone with us to their great grandparents graves on special days and they have listened to their great aunt tell stories about the family. The boar is actually a very good year! 🙂 I was born in and married in the year of the dog, and I married another dog!